“Never again wonder where to launch your startup” is the motto of this new online resource. In essence, it features the most recommended blogs you can submit your startup to for it to be reviewed. The site also lets the user find and contribute tips on how to get a review, get accurate data about each blog and easily tip off your startup and be reviewed. As a user, you can select your startup blogs by their Alexa Rank, Page Rank, the language that is used, and also which countries the visitors come from. 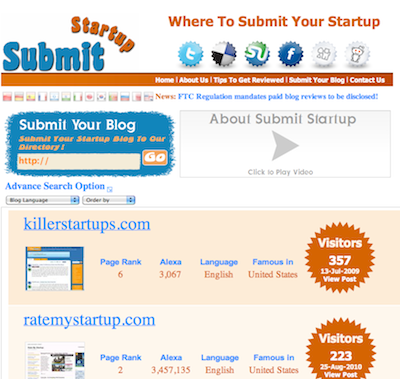 A noteworthy aspect is that the data which SubmitStartup captures is analyzed over time by a proprietary algorithm to rank blogs by the value they provide to their visitors, taking into account estimated traffic and also the expected outcome that a post from any given blog can redound to. All in all, an interesting way for current and budding netpreneurs to put themselves and their projects across more efficiently, and without having to incur into any cost or time-consuming operation.